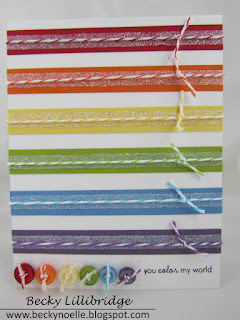 Today's Make it Monday challenge is to add a strip of glitter using scor-tape. I looked at today's card and at some of the works in progress scattered around my studio and my color scheme kind of threw me, i usually have to have kraft on everything and usually only use one or two additional colors, but right now my desk is covered with gradient rainbows on white backgrounds, what's up with that? then i looked to my right and my new ribbon wall. *ohhhh* i finally freed my loose ribbon from their vases this week and knotted them all on book rings and hung them from my studio closet door, isn't it pretty!? Tomorrow my mom and our friends are coming over to play in my studio with me. Wednesday my mom and i are going out for lunch and a pedicure. Thursday night we leave for Disney. Friday i have a race expo, a fabulous lunch at Les Cellier @ the Canadian Pavilion in Epcot and then a fabulous evening in the parks. Sunday i'm running in the Princess Half Marathon! Which will bring my half marathon count up to 5! Thanks for stopping by! lemme know what you think and have a great week! 1/4 inch tape: stamp it! Love how colorful your card is. I also like how you used the twine. You used the perfect sentiment for this card. Very fun! Sounds like you have a fun-filled week. Good for you! Have a great week! I love all the colors you used! So pretty! This is just gorgeous. i just love color and you used it so well here. Fun card! It makes me think of rainbows and candy, LOL! 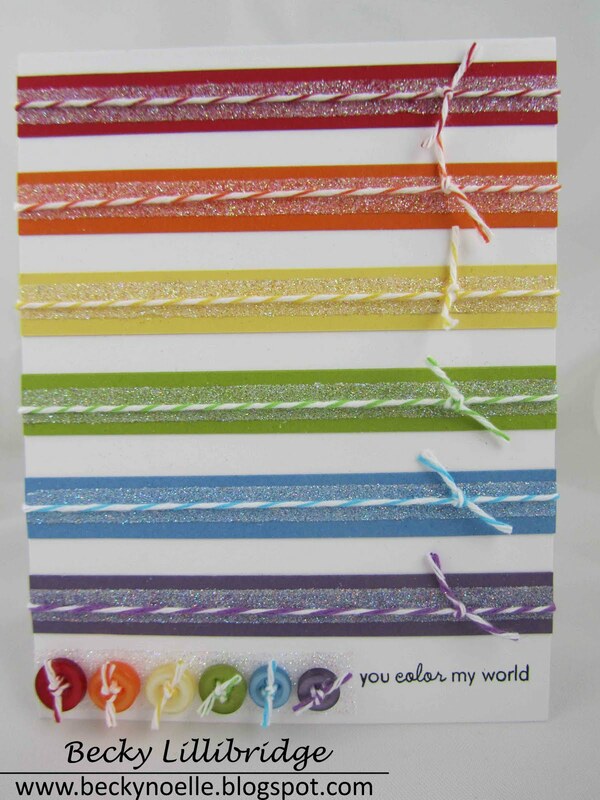 Love the match up of baker's twine and glitter! Such a happy card. Love the textures and the way you added the matching baker's twine. Cute! Very fun and great colours!